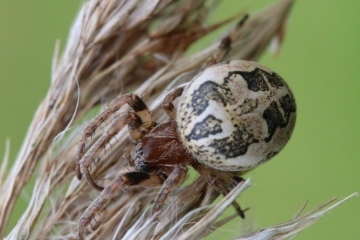 Yes, this is Larinioides cornutus. It may well not have been adult, which could only be ascertained by seeing if there was a fully developed epigyne on the ventral side of the abdomen. Incidentally the epigyne of this species often doesn't look too much like the figures in books, because the tongue can become broken off and because the epigyne can become distorted. Your photos are almost certainly juvenile Steatoda bipunctata, although there is an outside chance that it could be poorly marked juvenile S. grossa. You can see from the Steatoda bipunctata map that this spider is very widely distributed in Britain, although it gets scarcer further north. It is almost certainly under-recorded, and probably occurs in most buildings and gardens in the southern half of the country anyway. It is harmless to humans. Is this Rabbit Hutch Spider? 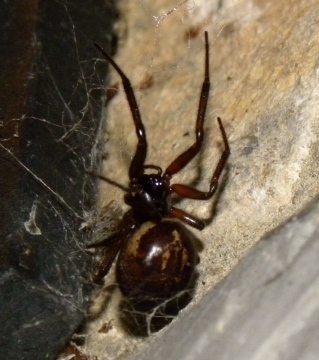 Yes, this looks like Steatoda nobilis, the so-called 'noble false widow', the spider which the media make such a fuss about. It has been frequent in the southern coastal counties of England for a great many years, without causing any problems. It is also nowadays frequent in the London and Surrey areas. You can see a reasoned outline about the spider on the website links on the SRS, BAS and Buglife websites.